Three days remain in the presidential campaign, Saturday, Sunday and Monday. In central Ulaanbaatar, there still is very little of a sense of excitement or at least public drama around the campaign. Certainly, residents of the downtown core are a very specific demographic and do not reflect overall voter sentiments in the country, but the lack of buzz continues to be noticeable. Even without buzz, I’ve been able to learn bits and pieces of observations and speculation about the campaign and the upcoming votes. The general sense of the MPRP Udval’s campaign is that it is somewhat half-hearted. Somewhat disappointingly to some, other women in politics have not supported her candidacy and most have not even acknowledged the historical significance of the first woman candidacy. Udval herself has pointed to the lack of funds available to her in the campaign as an explanation, though most campaigns would complain about such constraints. At least, a spot that had been held by an Udval billboard, that had been removed, was filled again on Sukhbaatar Square yesterday.The photo on the billboard shows Udval with the official photo that will also appear on the ballot in the election on Wednesday. I have not heard any discussion of Udval’s likely goals or performance in Monday night’s candidates’ debate. The MPP seems to be framing the vote largely as one of support for an incumbent (Elbegdorj) which would create DP dominance for the coming three years, as opposed to a vote for Bat-Erdene who would bring about cohabitation between the MPP president and the DP-led government coalition and thus represent some kind of balance. There are frequent complaints about the unfairness of DP dominance of state institutions, yet these are complaints that sound eerily familiar from previous elections and other parties regarding the role of the MPP in the past. There is one view that holds that if the result on Wednesday is closer than is perhaps generally expected and thus forces a run-off election, Bat-Erdene’s chances might be significantly improved. In such a run-off, so goes the assumption, Udval support would swing entirely to Bat-Erdene and he might carry any momentum that he might gain in the candidates’ debate into the period before the run-off election, a period when no further campaigning is permitted. 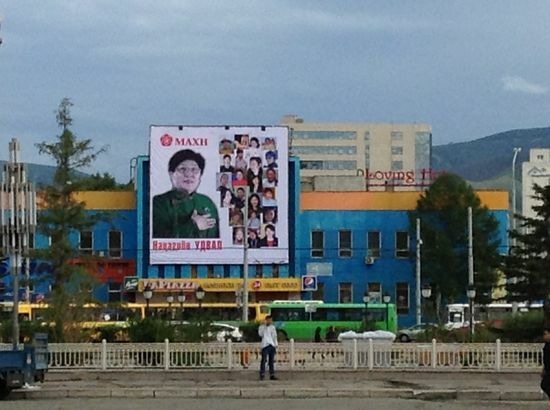 The dominant view in Ulaanbaatar is still that Elbegdorj will win in the first round. He has clearly been very active campaigning in the provinces, obviously trying to combat the imbalance in DP support between the city and the country. His main task for the debate on Monday is to keep his cool, look presidential and to cast a light on Bat-Erdene’s lack of political activities despite having served in parliament for years. There is none of the obvious tension in this presidential election in the city that was so palatable in 2009, following the 2008 riots. A quiet campaign also means a quiet atmosphere for the most part, though it’s best to recall that the ger districts surely harbour some reservoirs of discontent with the lack of economic opportunities that are accruing to many ordinary Mongolians while the country is booming. This entry was posted in Democratic Party, Elections, Mongolian People's Party, Mongolian People's Revolutionary Party, Presidential 2013. Bookmark the permalink.